The haze is getting worse in Kuala Lumpur and I've been at home trying to avoid it for the weekend as we both are feeling a little unwell. 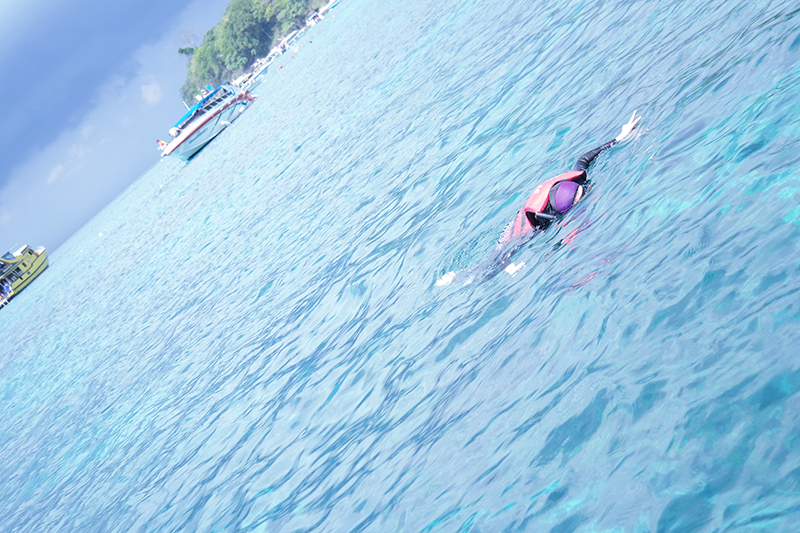 Somehow, my mind keeps thinking about the fresh, fresh air, the warm sunny blue sky and the crystal clear waters of Phuket. So I decided it's a good time to continue blogging about it! 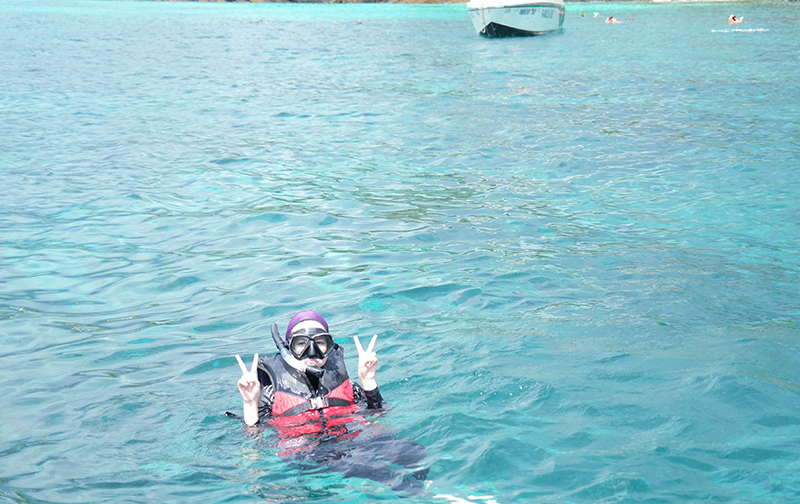 I would just love to be in the middle of the sea right now, swimming care-free and just snorkelling away with the fishes. It's one of my most favourite activity during a beach getaway. It's definitely a must! I love to swim. It's one of my most preferred exercises. But there's just something about that special feeling when you are swimming in the sea that can't be beaten. 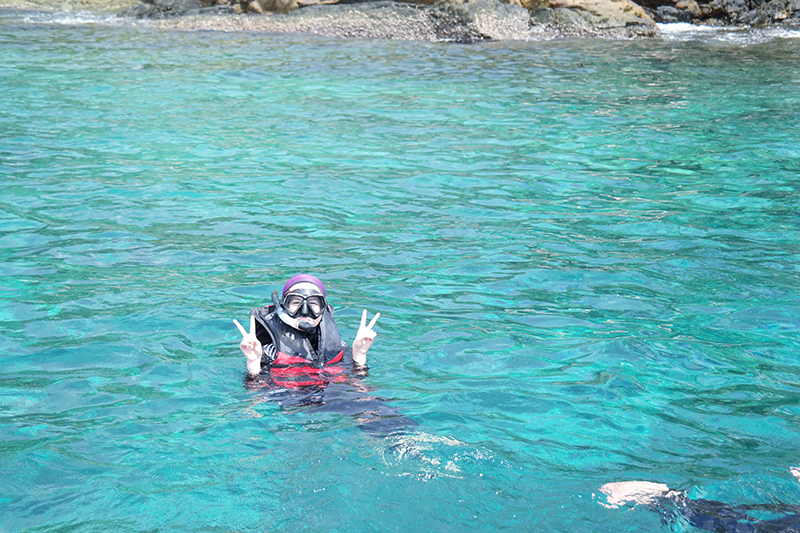 I first snorkeled in 2007 in Pulau Perhentian Kecil in Malaysia. That was my first experience when I went with a group of friends. 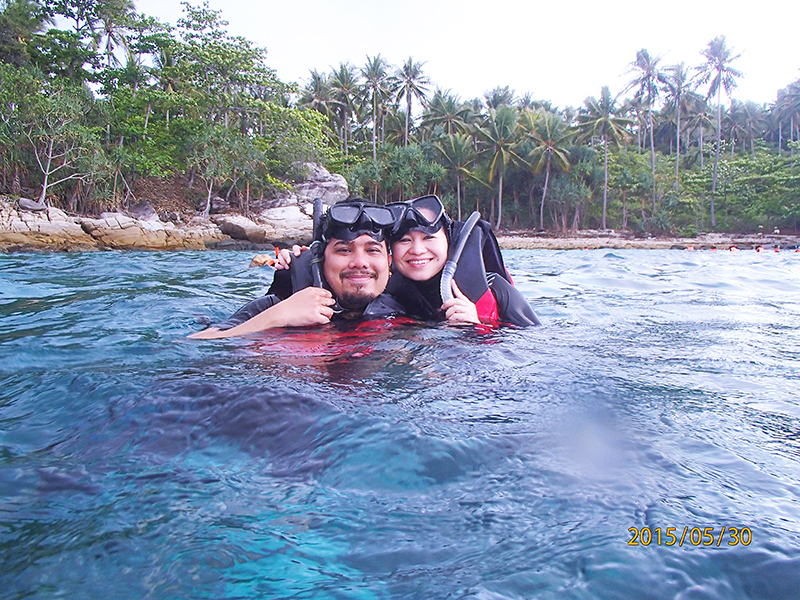 I loved it so much I went back again to Pulau Perhentian Kecil a month or two later in the same year. Hooked. 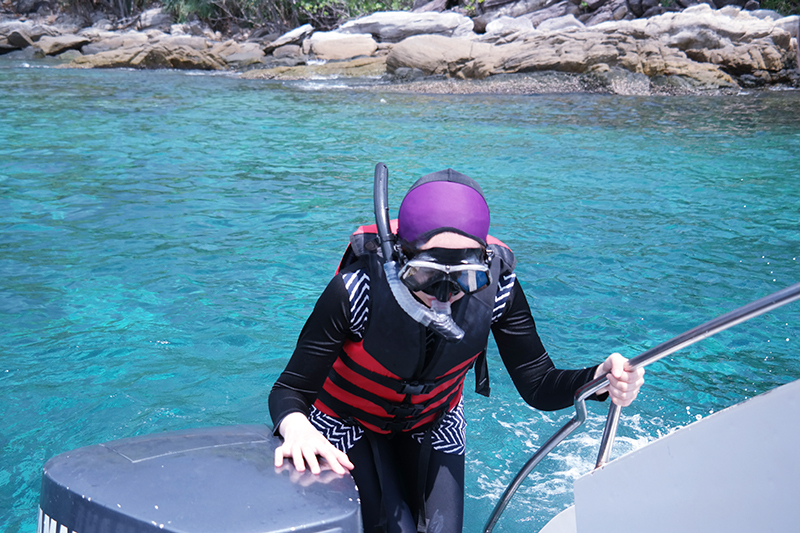 I went snorkelling again for a few times in Pulau Redang, Malaysia in 2013 and Krabi Thailand in 2014. 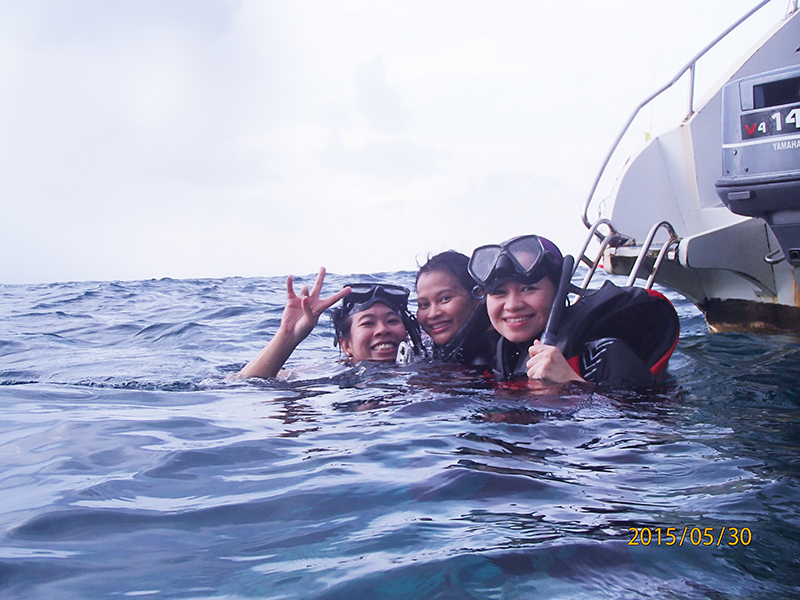 The first time I went I was quite scared because I'm not much of a good swimmer at all but because I was with friends, I was just super excited. 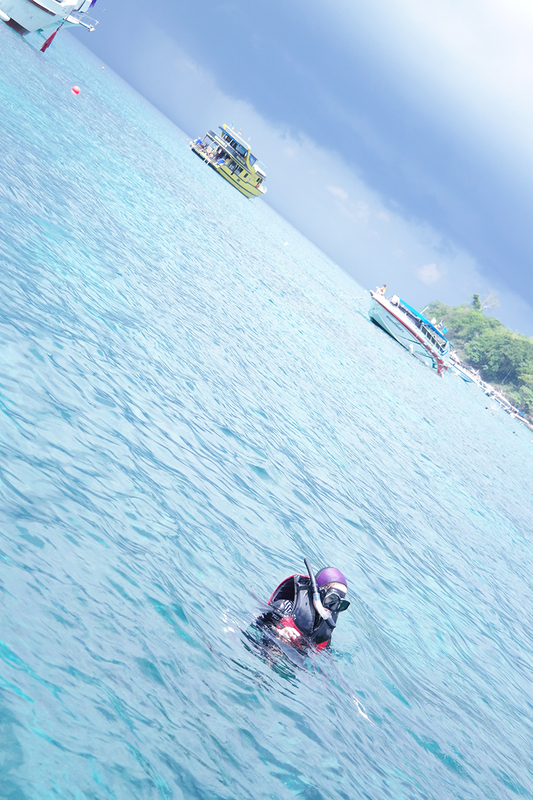 When I first saw the beautiful array of fishes and the lovely corals, all my fears disappeared. 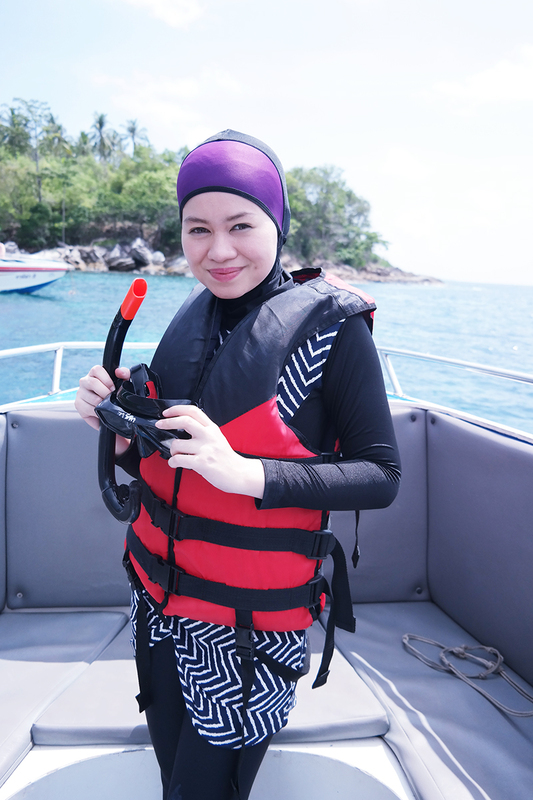 In my first snorkelling activity, I even saw baby sharks (okay that was initially scary but it was harmless) and turtles too when I was at Perhentian all those years ago. After that, I couldn't get enough of it. 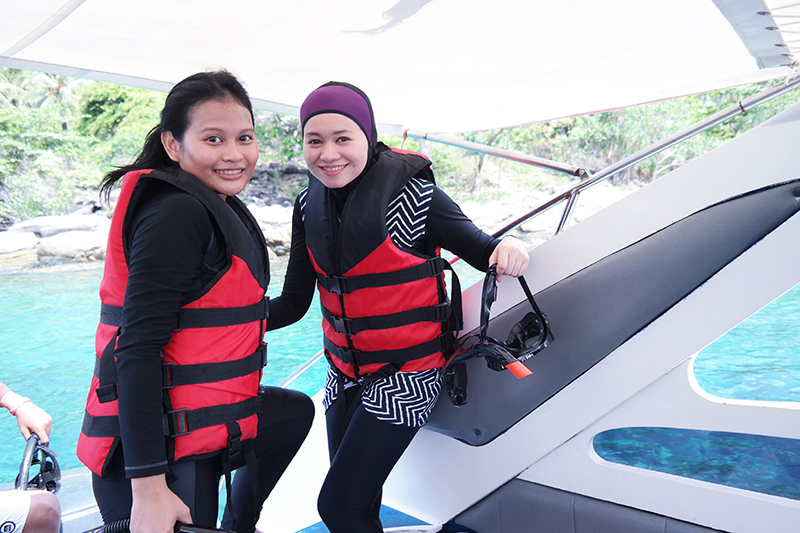 In my previous posts Exploring Phuket 1 : Getting Around & The Hotel and Exploring Phuket 2 : All White at Palm Seafood , I shared about what we did the first day we were in Phuket to prepare for our snorkelling and island hopping day. Well, on day two, we woke up super early with our provisions and set-off for our much-anticipated activity! I'll share about that in another post. Usually the boats will bring us to the normal spots for snorkelling where there will be a lot of boats around in the same area. This time, our ushers told us they were going to bring us to places outside of the over-crowded touristy spots and instead would bring us to spots where there were not so many people, these so-called hidden gems with crystal clear waters and a more relaxed environment. There were other boats, but not a lot. 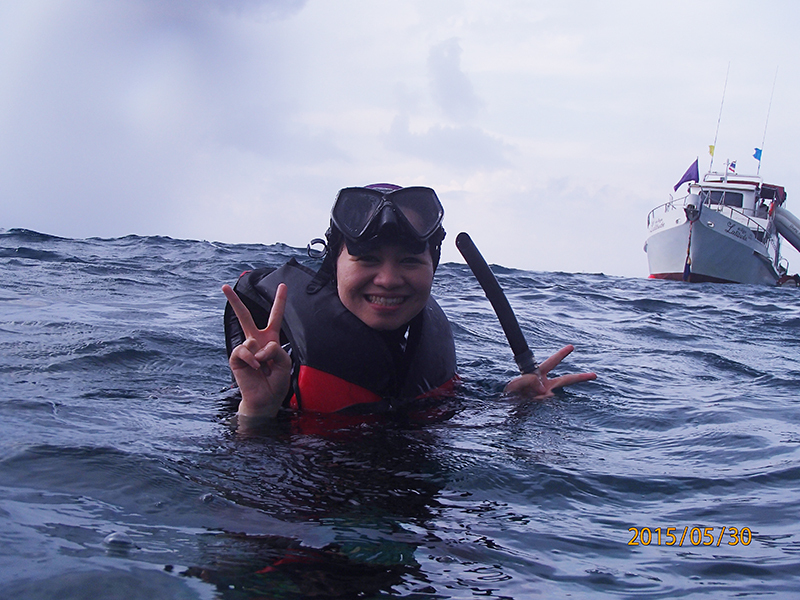 The best thing about snorkelling to me is the calmness, the peace and just observing the undersea world. When you see the sea and the ocean from above it's already something gorgeous but observing life under it is just something that you have to experience for yourself. I'll share some underwater photos as well as the private boat ride in my next posts soon too. We had a good time snorkelling and were especially grateful that my friend Sarah brought her underwater camera so we took quite a bit of pictures. But, we couldn't take all of our sweet, leisurely time to swim with the fishes because we realised that there was a big dark cloud that was approaching and that it's about to rain. 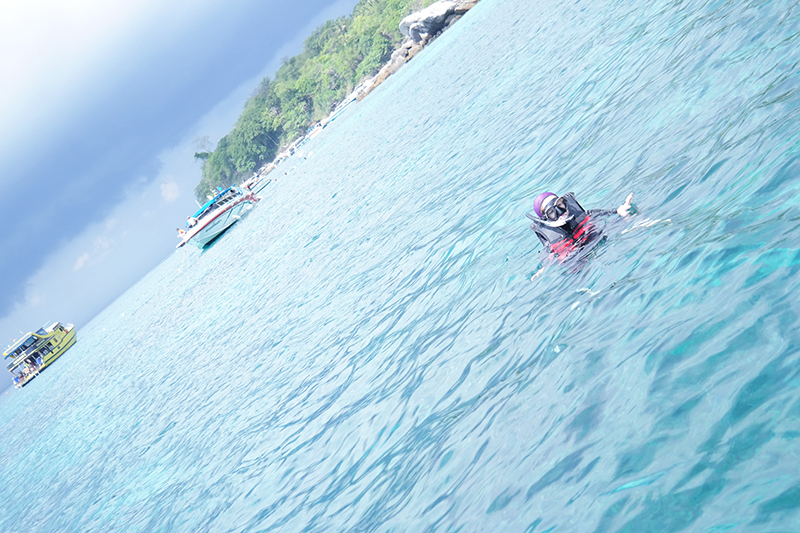 So we quickly went back to the boat and continued our journey to Racha Island. Did it rain? Well find out in my next post. Hehe. Oh, and for all of you who asked: I got my outfit from a swimwear shop in Singapore when I was there last year. ehehe baru baca. 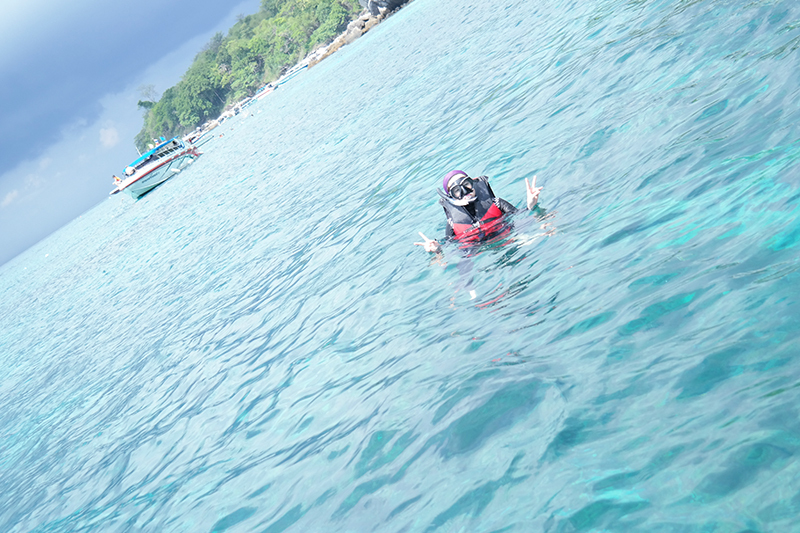 missing phuket seriously man.. next time... i will go again (when i am in kelantan).. and will be heading to Similan Island. One of the best island in the world. Google it!